Russia's President Dmitry Medvedev has said Prime Minister Vladimir Putin's description of the UN resolution on Libya is "unacceptable". The rare rebuke came after Mr Putin said the resolution resembled "medieval calls for crusades". Mr Medvedev said such comments could "lead to a clash of civilisations". The UN resolution, which Russia abstained from voting on, authorised military action in Libya to protect civilians from pro-Gaddafi forces. Mr Medvedev told Russian news agencies: "Under no circumstances is it acceptable to use expressions which essentially lead to a clash of civilisations, such as 'crusade' and so on. "It is unacceptable. Otherwise, everything may end up much worse compared to what's going on now." Mr Putin had said UN Security Council Resolution 1973, which was adopted on Thursday, was "defective and flawed" as it "allows for everything". The resolution authorises "all necessary measures" to protect civilians in Libya, but Mr Putin said there was no logic in killing civilians to achieve that end. Mr Medvedev's comment appears to be a slap on the wrists for Mr Putin. By commenting on the UN Security Council resolution and the coalition's actions, Mr Putin was straying into foreign policy - traditionally the president's business. We have heard Mr Medvedev rap the knuckles of his prime minister before. Last year, after Mr Putin spoke to the media about the trial of oligarch Mikhail Khodorvksy, the president responded by saying that officials should not discuss the case in public. But it is not clear whether these verbal differences mark a break in relations within the political "tandem" running Russia, or whether they simply reflect the two distinct roles which Mr Putin and Mr Medvedev have adopted as part of the same team: Mr Medvedev playing the "good cop" - the liberal reformer, the Westerniser, the moderniser - and Mr Putin representing the hardman of Russian politics. He said he was worried at the ease with which decisions to use force in international affairs were being taken. Mr Putin and Mr Medvedev's comments are the most public sign so far of a split in Russia's political leadership. Mr Medvedev has traditionally been seen as "Putin's man" and many had expected him to return his title to the former President Putin at elections next year. Analysts have suggested that Mr Medvedev is attempting to position himself as a modernising force in the run-up to the elections. But in November last year, Mr Medvedev warned that Russia risked slipping into a period of political "stagnation" by being dominated by the pro-Kremlin United Russia party. 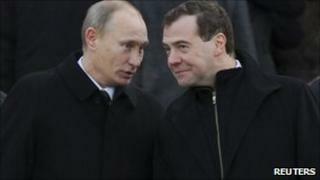 Neither Mr Medvedev nor Mr Putin has publicly declared their intention to run for the presidency. The BBC's Steve Rosenberg in Moscow says Mr Putin's strong criticism of the UN's resolution could be designed to distance himself from Mr Medvedev's foreign policy decisions and to boost his own domestic popularity by talking tough. However, his comments are unlikely to change Russia's approach to the Libyan crisis, says our correspondent - which has been to criticise the coalition's military intervention but not stand in its way.